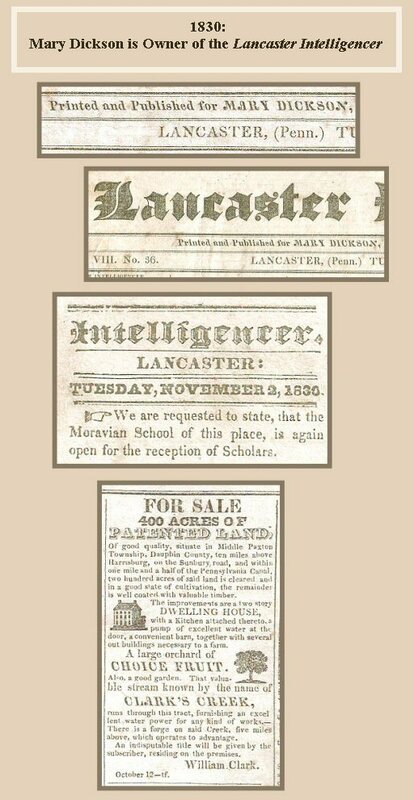 William, Mary, and Robert Dickson were Scots-Irish-American godparents of Lancaster's former Lancaster Intelligencer newspaper, the newspaper that eventually became today's Intelligencer Journal. The Dicksons brothers, William and Robert Dickson, and William's wife Mary, founded the Lancaster Intelligencer in 1799, five years after William Hamilton founded his own Lancaster Journal. William and Mary Dickson will always be remembered as powerful voices for freedom of the press: In 1806 William was thrown in jail for three months by the Federalist judge Robert Coleman, for so-called libel against the Federalists. Mary Dickson refused to ask Governor McKean for a pardon for her husband. She insisted that her husband had done no wrong. The Dicksons' insistence on a free press was an important early struggle for an essential American freedom. Mary evenutally became the Intelligencer newspaper's sole owner and guiding force, when her husband William died in 1823. 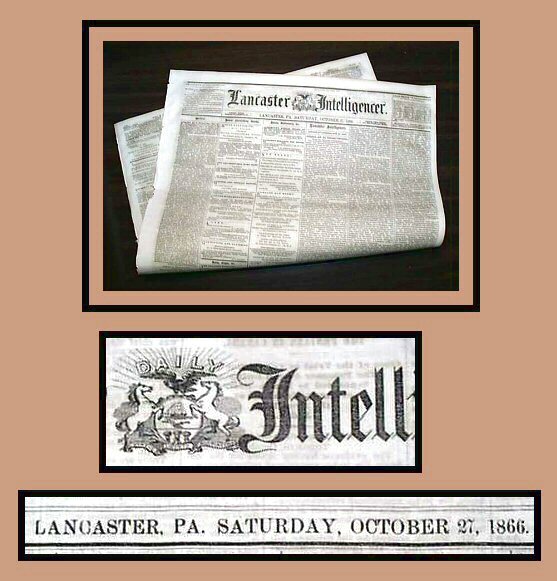 In 1839 John Forney combined the Dicksons' Intelligencer with the Hamilton Lancaster Journal, to propel these two newspapers on their way to becoming today's Intelligencer Journal. P.S. Four days after the issue of the Intelligencer newspaper I show here, a 30-year-old Andrew Jackson Steinman became co-publisher of this same paper, on November 1, 1866. That fateful November day was the first day of the Steinman family's involvement in Lancaster newspaper publishing. The Steinman family continues publication of this newspaper today. It is Here and Here. Above: The American Museum was the first American literary and political magazine. It also was one of the first American periodicals to focus on American topics. Philadelphia printer / publisher Matthew Carey published this magazine from 1787 to 1792, in 12 volumes. He farmed out the printing of this 1799 issue to William, Mary, and Robert Dickson in Lancaster. Above: Nonconformist Alarm Bells: Grundlegung zum Thaetigen Christenthum (An Alarm to the Unconverted) by Joseph Allein, the English Puritan Nonconformist pastor. Joseph Allein was booted out of the England's Anglican Church in 1622, ...and was thrown into prison because of his Puritan beliefs, which defied England's official, state-sponsored religion. Like the Puritans, Lancaster's Amish and Mennonite families had also been imprisoned and tortured by Protestant church-and-state governments, when they were living in Switzerland and elsewhere in Europe. Even today, Lancaster's Amish and traditional Mennonites are very wary of "faith-based" government. P.S. I photographed these Dickson books on circa 1930s Amish hooked rugs. Mary Dickson's Extra-Tidy Print Shop: "Fit for a Parlor"
Mary Dickson was a printer, a power broker, and the owner of a very-tidy print shop. When her husband died in 1823 (William Dickson the Printer), Mary took charge of the print shop and the Intelligencer newspaper. She kept the ball rolling. "The printing-office was in a two-story back building, -the upper room being for the types and the lower for the press-and never have I seen another establishment kept so clean and tidy. The credit did not belong to the printers, but to the neatness and care of the proprietor [Mary Dickson]. How could we put pi [spilled type], and broken leads, and battered types on the window-sills, or paste pictures and scraps on the wall, of a room that was fit for a parlor!" "The press was of the ancient order. It was a super-royal, stone-bed, wooden-platten, two-pull 'Ramage' -all the elasticity of the return motion being in pieces of felt inserted in the frame. The form was inked with balls. Many a weary arm and sore hand tested the qualites of that olden affair and its accompaniments. Printers will understand my description, and only for them has this paragraph been written." 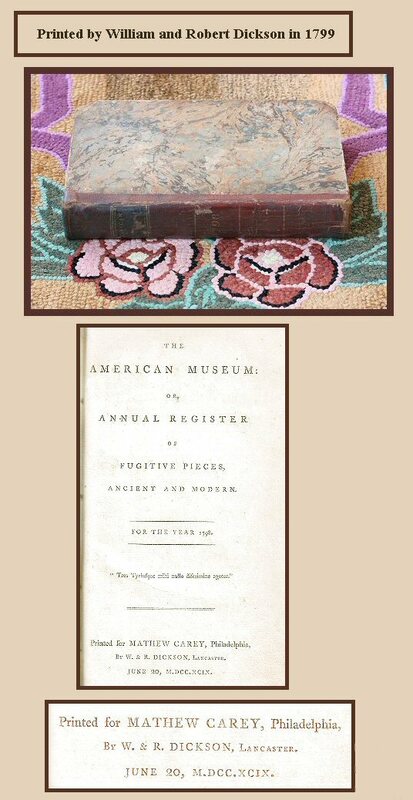 In 1829 U.S. President Andrew Jackson appointed Mary Dickson postmaster of Lancaster ...Mary's reward for being a very smart (and tidy) Jacksonian. Ten years later, in 1839, John Forney merged this Intelligencer newspaper with the Lancaster Journal. Mary's former newspaper continued its evolution into today's Intelligencer Journal.